A girl with cancer gets a sparkly Christmas wig from a friend in this illustrated children’s book. Ben usually plays outside, alone, as the other kids in his neighborhood are older. But one day, a moving truck arrives, bringing a small, three-person family: a father, a mother, and a girl who’s Ben’s age. She uses a wheelchair, and her name, Torey, is written in silver on the back. Ben’s parents invite the new neighbors to dinner, and he asks the girl why she’s in a chair. “The same reason I keep losing my hair,” she says; the illustration shows that she wears a scarf to cover her head. Torey adds that she’s been sick, but is getting better. Later, when Ben’s mother tucks him into bed, she explains that Torey has cancer, for which she’s had lengthy treatments. 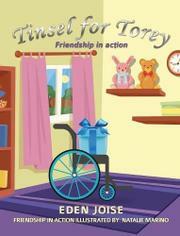 Ben kindly wants to help Torey and make her smile, and they become best friends. At Christmas, Ben decides to make Torey a gift, so that her head won’t be cold: a wig made out of silver tinsel that he took from his Christmas tree: “I wanted your head to be warm, and see yourself as pretty as you are to me,” he tells her. Over time, Torey regrows her long, brown hair and recovers, but she and Ben continue to send each other Christmas presents each year. Debut author Joise tells a straightforward story about how friendship may be translated into concrete action—a good lesson for kids. The tinsel wig creatively combines Christmas-y elements with a practical gift. Torey’s full recovery, though, could possibly raise unrealistic hopes for young readers who know someone with cancer. Marino’s (Zinyama Village Road, 2016, etc.) illustrations depict Torey as pink-cheeked and grinning throughout, even while she receives painful treatments; as a result, it’s unclear why Ben needs to “make Torey smile,” or why a girl with cancer isn’t ever shown to frown or cry. Readers may get the impression that Torey feels like she must reassure others, rather than express her own fear, sorrow, or anger. A kids’ story with good intentions, despite some stumbles.